There are places in Chicago where violence can erupt over nothing. These are street corners, alleys, schoolyards, lawns—common sites. But the people in them are uncommonly poor, oppressed and angry. They reach their boiling point early in the day, and disrespect alone can be too much to take. This isn’t the Chicago I’ve seen in person. My trips there have showed me great architecture, great shopping; exposed me to fine art and cool music. I’m a tourist. Occasionally, The Interrupters shows us that Chicago too—mostly in brief tracking shots of gleaming towers like the ones I walked beneath. But the towers are always moving, because the people director Steve James is documenting here are bussed past beauty and wealth like this, and on to dilapidated schools and homes where aspiration just doesn’t seem appropriate. The Interrupters tells several of their stories. We meet Caprysha, an obese 18-year-old, seemingly alone in the world, equal parts angry and sad; and the Oliver brothers, who live under the same roof but belong to different gangs. Their constant fights have driven their mother out of her own home. And there’s ‘Flamo,’ a pissed-off hood who could make it in comedy if the things he complained about weren’t so immediate and deadly. These young people live in a rage-filled environment. Their survival depends on their ability to avoid conflicts that happen suddenly and escalate from words to fists to knives and guns in seconds. 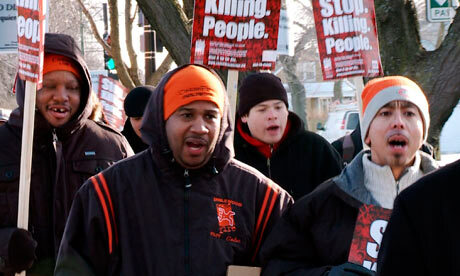 The Violence Interrupters are among the few allies they have. Violence Interrupters are men and women who voluntarily step into confrontations and try to defuse them. Part of an organization called CeaseFire, they’re former criminals themselves. They talk tough and stand down bigger, scarier, angrier people more effectively than you might think. They do it by appealing to their common sense; by reminding them that socio-economics is the real reason they’re prepared to fight and die over nothing but slights; and by reminding them, too, that they have an obligation to make things better. That this works as well as it does is really the point. We learn the Interrupters’ stories too. There’s Eddie Bocanegra: a car thief who spent half his life behind bars for a retaliatory shooting; and Cobe Williams, son of a drug addict. They’re earnest about their work (you’d have to be), but their pasts haunt them. James, and his documentary partner, author and New York Times columnist Alex Kotlowitz, show us photos of Eddie and Cobe and others in the bad old days. Lots of sunglasses, big hats, big hair and colorful clothes. The Interrupters know how seductive crime can be. The star of the film is a female Interrupter named Ameena Matthews. A former party-girl turned Muslim, she’s also the daughter of Jeff Fort, once Chicago’s most feared gang leader. Photos of him are intriguing: they’re images of a criminal, but also of a black power advocate, and Ameena, it seems, has inherited some of the latter identity while expelling the former. Physically small, she’s an immense personality who speaks bluntly—and loudly—to the young people she’s trying to save. I would’ve liked to know more about how CeaseFire works, and what happens when its methods fail. We get snippets of that—such as a board meeting with a South African administrator who expresses concerns about CeaseFire’s position relative to cops and crooks. And we meet an Interrupter who got shot. But little else is said about the organization’s vigilante element, or what it might inspire. I’ve no doubt CeaseFire has its critics. Surrounding everyone are lamentations. James gives us clip after clip of politicians talking, community leaders talking back, and pitiful piles of teddy bears, some covered in snow, marking the spots where teens were gunned down. Every one of these victims was loved. And hated enough, at least for a moment, to be murdered. These memorial acts amount to nothing, and they can be dangerous. The Interrupters shook me with an early scene, where a gathering of community members dissolves into angry shouting between the tearful father of the victim and the victim’s aunt. The purpose of the gathering—a call for safer streets—becomes ironic. Much later, Ameena speaks at the funeral of a murdered teenager, and calls for the young people in the audience to stand up and take account of themselves. She has watched them file past the casket and pose for photos with the corpse, as a sign of respect. The funeral director explains it: they’re just hoping that when they die, they’ll be celebrated the same way. He’s anything but glib; he tells the camera that 90 percent of the bodies in his funeral home belong to youths. The Interrupters is shocking and sad, and the immensity of the problem it describes cannot be denied. As a documentary film, though, it is average. It gives you the players, with their histories and their motivations, and follows them for a while. James’ earlier effort, Hoop Dreams, was far more than this. It told the story of two exceptional boys with a chance to escape the ghetto, and spun their tale into something epic. Hoop Dreams can’t be forgotten. The Interrupters isn’t about prodigies like Arthur Agee and William Gates. It’s about everybody else. It makes a point early, and keeps on making it, in the hopes we will get it just once. And while we try, Ameena Matthews will be on the streets, getting things done. The Interrupters screens this October at Toronto’s TIFF Bell Lightbox—part of Steve James: Documenting Dreams, a retrospective of the director’s work. James will be in attendance on October 7.